I’m not planning on this blog being a whine about the things that I can’t eat on The Norfolk Diet, but I do need to just get this one off my chest. I do love a nice banana. Chopped and cooked in my porridge and spiced with a bit of cardamom. But they’re going to have to be off the menu for February. Too many exceptions would be silly. Even if Will Giles grows them in his famous exotic garden in Norwich, I’m willing to bet they don’t fruit in February. Not that my porridge life need suffer too much. 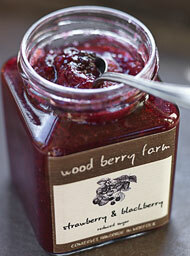 There are plenty of local jams and honeys to dabble in – I’m thinking that the Wood Berry compote* that the lovely Catriona makes at her Dad’s farm in Wicklewood, strawberry and blackberry for example, could be pretty darn’d luxurious. And probably something I honestly wouldn’t have got around to trying in porridge without the impetus of the Norfolk Diet idea. I’ll report on that one in due course. Another substitute thought is blueberries. I know there are a lot of blueberries grown in West Norfolk. I’ve just got to find a source of frozen ones. *Posh for low sugar jam. More or less.